I am writing to you in regard to the above named gentleman who is a citizen of the Republic Of Ireland, though temporarily residing in Northern Ireland for the past year. The background details of his case I understand he has forwarded to your Stormont Castle address by the Royal Mail "Special Delivery" service on 9th December 2005. Please also find enclosed a report from his GP outlining in the strongest possible terms concerns regarding Mr Finnerty's well being, the contents of which I would wholeheartedly endorse and support. Mr Finnerty is keen to return to the Republic Of Ireland and resume his former lifestyle. Crucial however to this, is the matter of the extant warrant for his arrest and in particular the issue of securing adequate time for his defence. His efforts to secure proper legal representation have been thwarted at every turn and Mr Finnerty is firmly of the belief that this situation is a serious breach of his rights under Article 6 (3) (1.b.c.) of the European Convention of Human Rights. It is however of equal importance to quote Mr Finnerty's words in his e-mail of 21 October 2005. "the huge fear in me of appearing in court has nothing whatsoever to do with contempt for the law, or with contempt for the courts: instead, it is entirely a function of contempt for corruption". 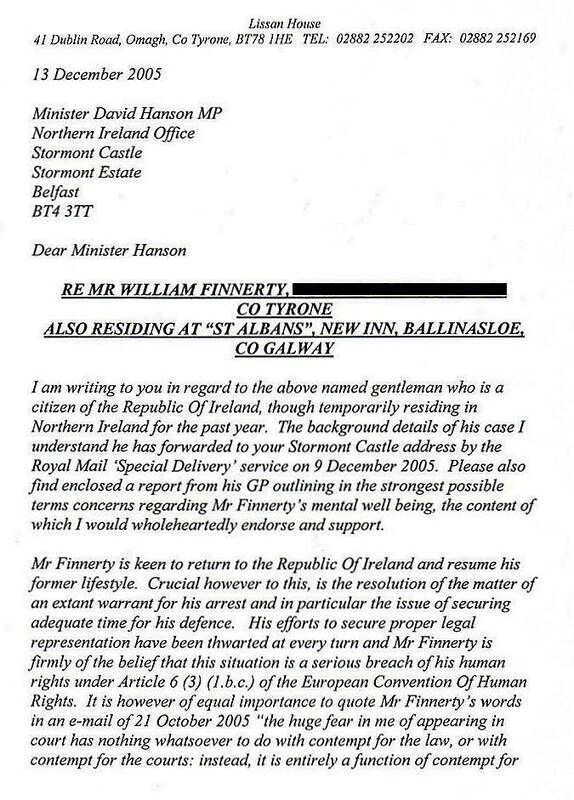 In your capacity as Minister For Justice I am sure you would wholeheartedly welcome and endorse Mr Finnerty's sentiments. 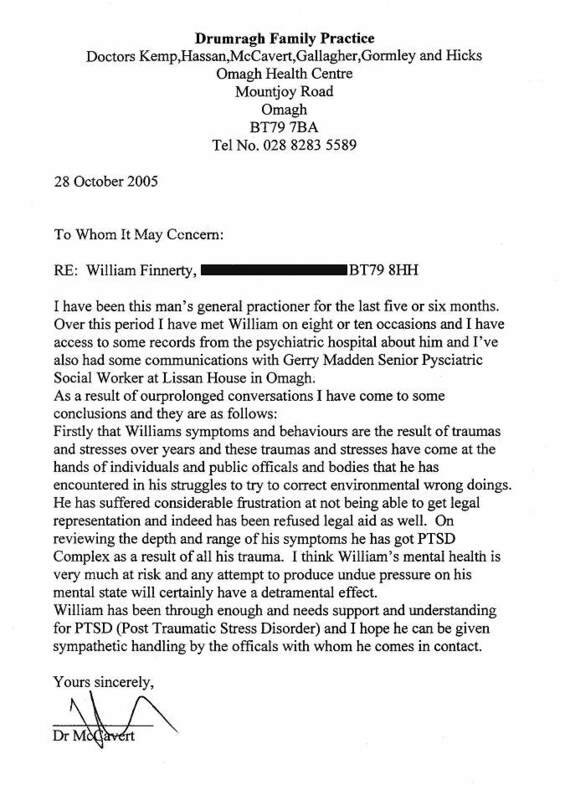 Dr McCavert, GP has spoken of Mr Finnerty as suffering from PTSD Complex - as I understand it, "explosive anger" can be very much an integral, manifest symptom of this condition and Mr Finnerty would very much contend that it is within this context, that the aetiology of the original incident in 2002 lies. Since his moving to live in ***** there have also been a number of outbursts on Mr Finnerty's part. All of which are a worrying indicator of his current fragile mental health and underscore the need for sympathetic understanding and tolerance by the various authorities and bodies towards him. In conclusion then Minister McDowell, this is clearly a very complex and serious case but which assurances from yourself would go a long way in resolving. Fundamental principles of Human Rights and justice are at the heart of this matter and indeed, I believe, also your own department. I look forward then to receiving an early reply - in the meantime, should you wish to discuss/clarify further any aspect of all the above, please do not hesitate to contact myself directly. I have been this man's general practitioner for the last five or six months. 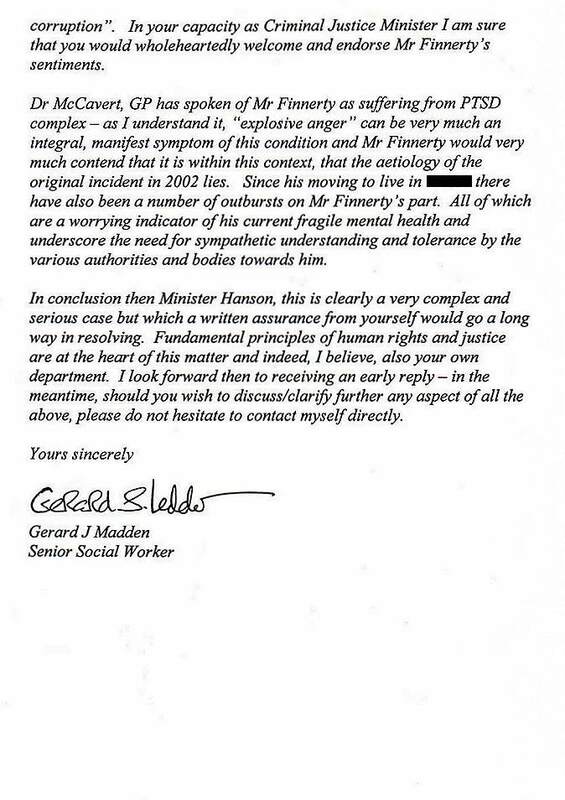 Over this period I have met William on eight or ten occasions and I have access to some records from the psychiatric hospital about him and I've also had some communications with Gerry Madden Senior Psychiatric Social Worker at Lissan House in Omagh. Firstly that William's symptoms and behaviours are the result of traumas and stresses over years and these traumas and stresses have come at the hands of individuals and public officials and bodies that he has encountered in his struggles to try to correct environmental wrong doings. He has suffered considerable frustration at not being able to get legal representation and indeed has been refused legal aid as well. On reviewing the depth and range of his symptoms he has got PTSD Complex as a result of all his traumas. I think William's mental health is very much at risk and any attempt to produce undue pressure on his mental state will certainly have a detrimental effect. William has been through enough and needs support and understanding for PTSD (Post Traumatic Stress Disorder) and I hope he can be given sympathetic handling by the officials with whom he comes into contact. Please note that the translated text appears in the pages with the yellow background only.